Dorado (Mahi) Fishing still great and some Tuna coming in. 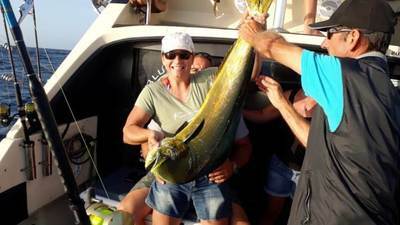 Home | Browse | South Africa | KwaZulu-Natal | Durban | Dorado (Mahi) Fishing still great and some Tuna coming in. So far we have had a superb Dorado season, it started early with a big fish; pretty much we getting Dorado every trip. Yellowfin Tuna were scarce for a while but they are now starting to show up. Marlin have also been around. The current seems to have settled and we have some nice warm water so we expect Wahoo to show up anytime, they are late. The next 3-4 months are looking to provide us with some great fishing with Fat Girl, Nawty Girl and McFire ready for action.